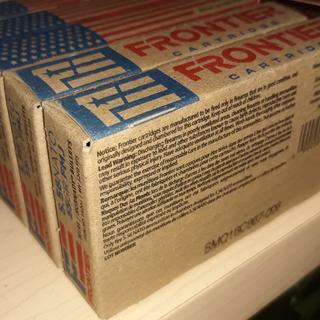 AMERICAN MADE AND BUILT ON TRADITION – THESE ARE THE HALLMARKS OF FRONTIER®CARTRIDGE. Frontier Cartridge features Hornady bullets in 223 Rem and 5.56 NATO. Applications range from plinking, target shooting and hunting to law enforcement training and self-defense. State-of-the-industry loading techniques and quality control procedures ensure the reliability of every Frontier Cartridge round. Frontier Cartridge offers ammunition configured for a wide range of shooters and applications, everything from plinking, target shooting and hunting to law enforcement training and self-defense. In addition to Hornady bullets in a variety of offerings, Frontier Cartridge features brass cartridge cases and military-grade boxer primers and propellant. Can the 30 round mags be swapped to 10 round mags for California compliance? BEST ANSWER: Don't worry about the Mag's. you cannot buy Ammo mail order Direct in Commiforina. move to a free state. Perfect reply. I am falling in love more and more everyday. Can't you have it sent to a FFL and pick it up there? Will you ship mags & Ammon to New York for law enforcement? BEST ANSWER: If they can't ship it to law abiding citizens of the state of NY and United States of America then no they should not be able to ship it to the tyrannical government of NY. Is the ammo boxed or bulk pack? Can I get 10 of the D&H 30 round mags instead of the P mags ??? BEST ANSWER: I too prefer the D&H Mags over the P-Mags. Are the Mags compatible with the M&P sport 2 AR-15? Are the casings steel or brass? BEST ANSWER: All brass. Looks like MIL-spec ammo. Hornady is contracting with the Lake City Army plant to produce the Frontier brand of ammo for them. Its LC production. BEST ANSWER: This ammo shows no attraction to a magnet! The bullet does not attract a magnet. Does the ammo come loose or in 20rd ,50rd or 100 rd individual boxes ? The ammo is loose contained in a large plastic bag within the box. It comes loose in a clear plastic bag inside of a cardboard box. This ammo will come loose. Does the 10 Magazines come individually packaged? BEST ANSWER: Yes they are individually wrapped in hangar packages like you would see at the store. Yes the Magazines are in fact individually packaged from Magpul. You didn’t answer the guestion, can you substitute p-mag with D&H mags on this deal? BEST ANSWER: Bro you get 10 free mags basically free. Are these 5.56 mags reusable with .223 ammo? BEST ANSWER: Yes, they work fine with .223 ammo. Yes they are like any other, they are good quality and will hold either .223/ 556 or 7.63x39. What generation are these mags? Does this ammo have crimped primers? Is there a rebate on the ammo? BEST ANSWER: When I purchased mine last year there was not. I have recently noticed that as of now a rebate is available. I am looking to purchase more ammo in the next few weeks and will know for certain at that time. As in a mail-in rebate? No. Can you switch the mags with a different color? BEST ANSWER: That is not an option at check out. I would think you would need to buy them separately. I would call customer service number to confirm. I think this is a buyer's question for the seller.....Are these magazines available in a different color eg....OD Green....Black...Desert Tan....or....?? If not …..fit and function matters...color is a personal option. Will these always be sold on PSA or is it a special for the holidays? I don’t know Enter an answer to this question. How to get mail in rebate? BEST ANSWER: I bought them without the rebate, I assume you will send the receipt of purchase into hornady. Let me now how it goes. Does this require signature on delivery? Can you replace the 30 rd mags with 10 rd mags for Connecticut Compliance? Can I get a mix of magazines two 10, four 20, and four 30 round? Can the mags be swapped out for ct compliant? Love the Pmag promotion deals! Great ammo and great magazines! Since Pmags are my favorite mags this was a no brainer, comes out to $5 a mag since the ammo would be $300. Plus free shipping! 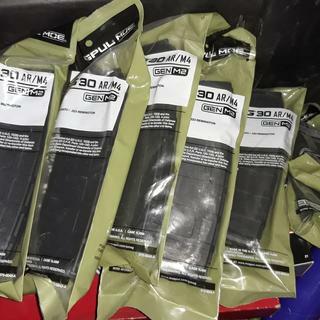 I would buy 20k rounds tomorrow if it was financially feasible and get my 200 Pmags😁. High quality 5.56 for $0.34/rd with ten free mags? Heck yeah. Great Deal everything was perfect! I was impressed by the timely manner this product was shipped. My only wish would be that the ammo were boxed, instead of being loose packed. Excellent deal for good ammo. The PMags were certainly bonus! PSA price and service, CCI and Magpul just doesn’t get any better!!!! The magazines are great and the ammo is awesome. Excellent combo at a good price. Both mags and ammo performed flawlessly. I’ve now bought this bundle twice and several of my friends have bought it on my recommendation! Keep the good deals coming! You can not beat this deal! Could I reload for less? Maybe, but my time is worth waaaaaay more than the few pennies I'd save. No ammo or mag problems so far either. I've bought numerous of these units of the 556 Nato boxes and their Great.....Never any failures either. I would recommend these to anyone for shooting. Still awaiting my rebate, but the ammo fires without misfire or malfunction. Can't beat the price. Highly recommend. Great deal. Just as expected from Palmetto! Hornady Ammo is great valve. I highly recommend it to all my gunshop customers. Awesome deal and product sub standard customer service. The ammo package plus the 10 magazine is a good deal. The only exception is the shipping and the communicating with their customer. They did not care to update their customers with shipping info or processing info. It took them over 4 weeks after I’ve sent them numerous email requesting for a refund for them to respond to me and shipped out the product. Overall my experience with the company is sub standard. Their lack of communication drove me to write this review since they sent me an email requesting this information. Fantastic deal for 1000 rounds Hornady Frontier ammo and 10 Magpul mags. This was an unbelievable deal. I am completely satisfied with the products and more so with the service. Plus you can never beat free shipping. I passed this deal to several friends and some have already made a purchase. Keep up the good work PSA. Everything was as I ordered it. Received it quickly with no issues. I will definitely buy again. Great, quality product, with prompt delivery, even over the holidays. I can't figure out the REBATE PROCEDURE! Great price, lots of fun! Ready for the next order. Great ammo and mags for an amazing price. Can’t beat combination of great Ammo and great magazines to put the bullets in! Can’t wait until I find a deal on 62 and 77 grain. Superbly consistent. I have shot around 500 rounds through my BCM M4 without a single misfire. I like it fine. I haven't shot a lot of it yet cause the weather has been less than desirable. I have no regrets buying it and will probably buy more. How can you beat a 1,000 rounds of good ammo and 10 Pmags for the price! get u sum bullets !!! Top notch ammo & mags! Stock up while you can with these low priced combos. A great round for everyday use and training and an industry leading mag for this price is a great deal. I have had no problems with any of Frontier's products, an I would highly recommend anyone looking for a cost effective round to try them. Not bad, had 6 duds out of 200 at the range. 3% fail rate isn't terrible but it's not great either. With the ammo and mags at this price I guess I can't complain too much. 1000 rounds of quality ammo and 10 quality mags with the rebate was a screaming deal! Love it! so far they shoot good no problems. The rounds I have fired have been consistent without problems. There is no loose powder or primers in the bottom of the bag these bulk rounds came in. I am very pleased and would recommend the purchase of such combo. In the grand scheme of things it wasn't that much ammo but if you work hard for your money like I do, You expect to get what you pay for. I've never been one to count out my ammo but in this case I was gifting ammo and wanted to dive it up fairly. I was shorted nearly 60 rounds which is two full mags. I sent PSA an email and they stated they would credit the money back to me. Its been a few days and I don't see that credit anywhere. Not sure if it's going to my account or back to my card. Lastly, and this says more about magpie than it does PSA but my Pmag springs seemed to be weak. After firing my last round the bolt would not lock "open" i suspected the follower wasn't extending up into the bolt with enough force. I stretched out the springs a bit and haven't had an issue since. Good price, and excellent customer service!